The Ras Al Khaimah exhibition has closed. Ride in a live-action snowboard race, control a Mars rover, design and play your own video game, capture your image in a 360 freeze-motion video. 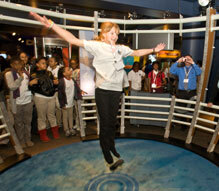 Experience real math at work in sports, nature, robotics, aerospace and more. A wide range of immersive interactive exhibits. Math has never been so sweet! For information and timings for school groups, visit the Field Trip page. Turn left from the Khatt Roundabout and right from the RAK Airport Roundabout. Take a right from the Karran Roundabout till the Lantern R/A. Take a right at the Lantern R/A and go straight from the Pot R/A. Turn left at the first traffic light and continue straight. The road curves right till the Ras Al Khaimah Women’s College is reached. Turn right at the Clock Roundabout. Drive past the RAK Hotel and Police Officers Club (on the left) and turn right at the next roundabout. Drive past Tower Links Golf Club and go straight at the Lantern Roundabout and the Pot Roundabout. Turn left at the first traffic light and continue straight till the Ras Al Khaimah Women’s College is reached. Founded in 1988 with four colleges, the Higher Colleges of Technology have grown to be the largest of the higher educational institutions in the UAE, gaining a well-respected reputation for innovative learning. Over 20,000 students attend 17 modern men’s and women’s campuses in the cities of Abu Dhabi, Al Ain, Dubai, Ras Al Khaimah, Sharjah, Fujairah and the western region cities of Madinat Zayed and Ruwais. HCT offers a wide range of English-taught programmes in the Faculties of Business, Education & General Studies, Engineering Technology & Sciences, Foundations, Health Sciences, Arabic & Emirati Studies and Computer Information Sciences & Applied Communications. These programmes are all relevant to the UAE’s fast growing and evolving economic sectors and embody HCT’s Learning by Doing philosophy. All programmes and courses are designed in consultation with business and industry leaders to ensure that the skills students learn are job-relevant and to high standards. They are constantly monitored to ensure they are at the cutting edge of industry standards and technological change. The Ras Al Khaimah Women’s College (RKWC) offers a range of modern programmes. Located just beyond the city centre, the college’s learning facilities are state-of-the-art and provide an excellent environment in which to work and study. Facilities include a student career centre, audiovisual studio, fully equipped Learning Resources Centre, computer and specialist laboratories and a full range of services aimed towards making the students’ time at RKWC a rewarding and fulfilling learning experience. Visit www.hct.ac.ae. Follow us on hctuae and @hctuae. For information about HCT Ras Al Khaimah Women’s College, visit http://rakc.hct.ac.ae/index.html.